In 1634 the the Pequots initiated peace negotiations with the Massachusetts Bay Colony. 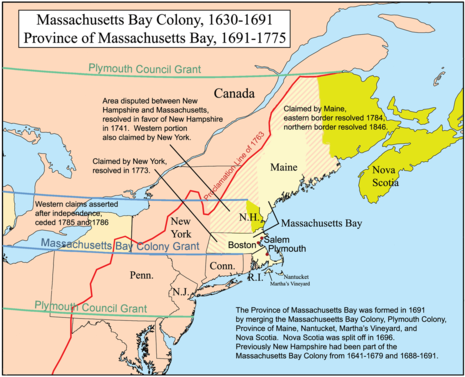 They wanted the English to re-establish trade and arbitrate a peace settlement with the Narragansetts. The Bay Colony responded with demands for exhorbinant tribute (1000 fathoms of wampum) and the surrender of the killers, something the Pequots were not prepared to do. The Pequot and their traditional enemies, the Mohegan, were at one time a single socio-political entity. Anthropologists and historians contend that sometime before contact with the Puritan English, the Pequot were split into the two warring groups.The earliest historians of the Pequot War have also speculated that the Pequot migrated from the upper Hudson River Valley toward central and eastern Connecticut sometime around 1500, but these claims are disputed by modern anthropology. In the 1630s, the Connecticut River Valley was in turmoil. The Pequot aggressively worked to extend their area of control, at the expense of the Wampanoag to the north, the Narragansett to the east, the Connecticut River Valley Algonquians and Mohegan to the west, and the Algonquian peoples of present-day Long Island to the south. All of these contended with one another for dominance and control of the European trade. A series of smallpox epidemics over the course of the previous three decades had severely reduced the Indian populations, leaving a power vacuum. The Dutch and the English were also striving to extend the reach of their trade into the interior in order to achieve dominance in the lush, fertile region. By 1636, the Dutch had fortified their trading post, and the English had built a trading fort at Saybrook. English Puritans from Massachusetts Bay and Plymouth colonies had settled at the newly established river towns of Windsor, Hartford and Wethersfield.